We believe that this means that despite comments that may have been made at last week's (10 July 2017) Parish Council meeting Settlement Boundaries and NSC's related Core Strategy, including CS33, still currently have a role in decision making. It also highlights the fact that if 'we' want to protect our rural village infill status residents/public need to make their comments and concerns directly to NSC as soon as possible. BPC have consistently refused to answer key questions such as this and/or to state their view of the Future of Bleadon. They have recently responded to our request to understand their duties, roles and responsibilities, especially in relation to Public Rights of Way (PROW), stating "Bleadon Parish Council is currently taking advice with regard to the requests and issues raised in your emails and will, when such advice has been received, respond, or not, to the requests and issues raised". Considering BPC is approving applications that seem contrary to the adopted Parish Plan that represents the views of 60% of residents, and that BPC are approving the building on green fields which also affect the public rights of way on the current three fields, we feel that it is important that BPC publicly inform residents of their duties and their 'plan/approach' to the future of Bleadon. 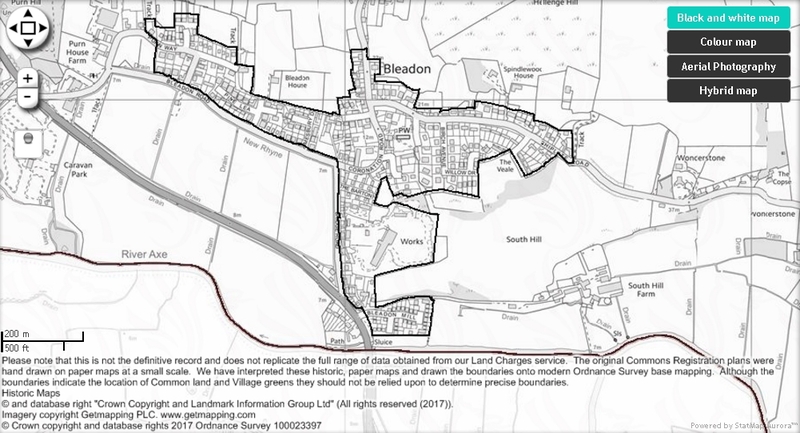 "A Parishioner asked about North Somerset Core Strategy / Settlement Boundary and Bleadon regarded as an Infill Village. The Chairman asked Cllr Porter to provide an update on the Core Strategy. Cllr Porter provided an update on the core strategy and highlighted that remitted policies only provide limited weight and there is currently not a settlement boundary at this present time for Bleadon." This minute was reflected by a resident who attended the meeting whose subsequent feedback to BOB stated that a NSC representative had said "the village fence and infill villages are not significant in the planning decision. What is significant is the number of objections we have to the plans"
Conversely, the Bleadon Parish Plan 103 Improvements as previously sent to all residents states "Conserve the rural character - Retain the green space between Weston and Bleadon . Through the Planning process vigorously question all development outside the Village Settlement . Protect and enhance bio-diversity and the rural landscape through the District Council's Planning and Environmental policies"
"it was concluded by an independent planning inspector that the Council does not currently have a rolling 5-year supply of deliverable housing land when measured against the residual housing balance of Core Strategy Policy CS13 and more deliverable housing land needs to be found. The consequence of this is that the Council’s housing policies, including CS33, are currently deemed to be out-of-date according to paragraphs 14 and 49 of the National Planning Policy Framework. This means they currently have reduced weight in deciding planning applications." "Whether sufficient housing land can be found at or adjacent to Towns and service villages to meet the deficit and give greater flexibility to housing delivery is likely to take a couple of months. If it cannot find enough sites in these locations, then there is a possibility that it may have to consider housing land at other locations." "However the reduced weight that can be given to housing policies and the need to build more houses means that some application which, ordinarily, would not be supported, can become more finely balanced." "Be assured that I am working hard (and I know Terry [Porter] is too) to preserve Bleadon's integrity as an infill village and to find sufficient sites elsewhere to meet the government housing target. In that context the land you mention is defendable under our policies and will be more so as we plug the housing gap. Obviously if NSC refuses an application on this land,which I would recommend, the applicants can appeal but I believe we could put a strong case forward,especially knowing the local support we would receive." "I therefore look to the Council to test the allocation of additional sites within the SAP which would have the capacity to accommodate up to 2,500 dwellings, and which have a realistic chance of being delivered by the end of the CS period in 2026." "A timetable should now be identified for the work required to test the provision of additional allocations, and to draft proposed modifications to the Plan which should include the additional housing site allocations. The work should include an evidence base to support the Council’s position on new housing site allocations together with a detailed (site specific) trajectory which sets out the timescale for delivery. The trajectory should be agreed as far as possible with the development industry." "In addition to the work on housing land, the need for a number of changes to the SAP were identified in the course of the hearings. The Council is requested to produce a set of worked up main modifications which include these changes, and which will form the subject of public consultation in due course. I look forward to hearing from the Council with a timetable for the work as soon as possible." "With effect from 16 April 2017, each Local Authority is required by law to create an easy-to-access Brownfield Register and publish it on its website by 31 December. However, only sites suitable for new homes are to be included"
"The National Policy Framework asks local authorities to encourage re-use of brownfield sites if not of high environmental value, and the recent Housing White Paper included proposals to further increase the take-up of brownfield sites suitable for homes"
Therefore, from the above, BOB's understanding is that these NSC policies still have some weight in deciding planning applications and that, in our opinion, Bleadon's green fields do not currently need to be considered for housing development until other sites, including Brownfield sites, have been identified, publicly consulted, then subsequently considered and exhausted. To our knowledge the Core Strategy, the associated Sites and Allocations and the Bleadon Settlement Boundary are not currently under public consultation. The fact that BPC appears to need to take advice to let residents know what their current duties are, and have a random approach to their decison making, is concerning. 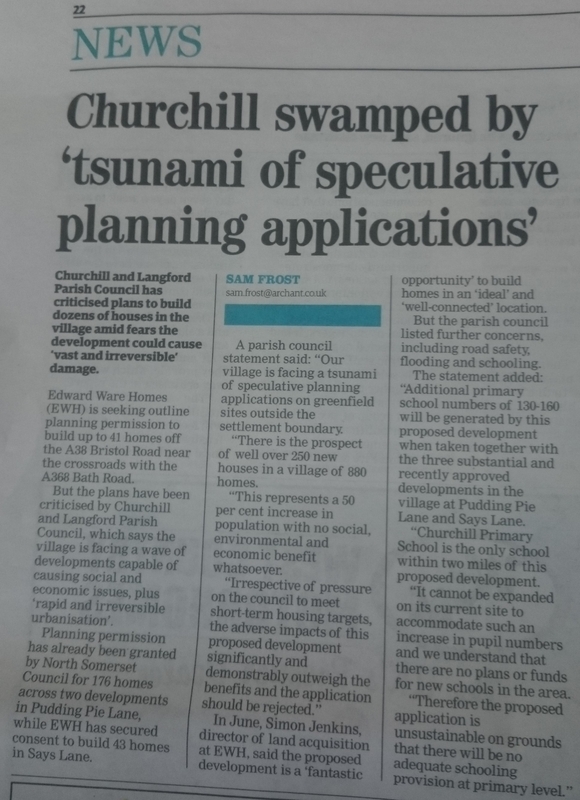 The fact that they may or may not let 'us/public' know what these responsibilities are when they find out is doubly concerning, especially during this period of rapid development in the parish, and as the precept of £39K funds them. BPC's restricted access to public information is reflected in their currently adopted Vexatious Policy (adopted June 2017) which has removed the section indicating 'Rights of Public Access'. What happened to the Nolan Principles e.g. "Holders of public office are accountable for their decisions and actions to the public and must submit themselves to whatever scrutiny is appropriate to their office." See Vexatious Policy Update Blog.